As lazy as I am about cooking breakfast on the weekdays (we usually have cold cereal, toast, or frozen waffles) I love to have a nice hot breakfast on the weekends. Geoff and I usually trade off making it... he's the king of anything egg-related, and I make all the baked goods. This week I had a baguette that was getting a little stale, and decided that it would be perfect for a baked french toast. I got all excited about making this recipe from my cute friend Sarah, and then discovered I didn't have enough eggs. Boo! Luckily, I found another recipe that looked promising, and was able to throw it together quickly. It chilled in the fridge overnight, and baked up beautifully in the morning, making the house smell like heaven. And the taste? To die for! I wouldn't say that regular french toast is necessarily at the top of my list for breakfast, but this french toast definitely is! 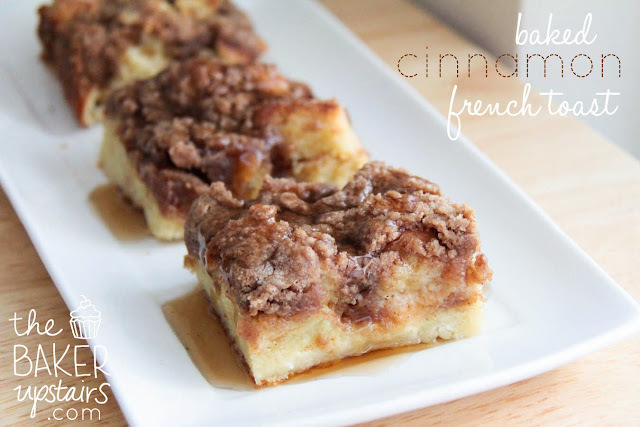 The cinnamon topping was crumbly and luscious, and the eggy bread underneath was moist and tasty. It was a universal hit at our house! I scaled down the recipe by a quarter (I used six eggs, and so on) to fit in a 9 x 9 pan instead of a 9 x 13, and used just whole milk instead of milk and cream. Definitely one to make again! In a large bowl, mix together eggs, milk, cream, sugar, and vanilla extract. Pour evenly over bread. Cover pan with saran wrap and store in the refrigerator for several hours or overnight. When you’re ready to bake the French toast, preheat oven to 350 degrees. Remove casserole from refrigerator and sprinkle crumb mixture over the top. Bake for 45-55 minutes, or until the French toast is set and golden brown. I'm not a breakfast girl, but......... seeing these amazing toasts and I'm changing my habit. I was actually planning on making overnight french toast this week, but I think I will try your recipe instead of making mine! It looks amazing. I'm a new follower!